Purchases for this Theme have been temporarily disabled. Please check back later. Update note This version 2 amends Anitya in depth to offer a real added value on ease of use. After upgrade from 1.x to 2.x you will need to work on some pages make some adjustments in terms of custom templates. If you meet issues, go away and send me a Support Request, i will help you quickly. Anitya is historically the first theme that I developed for Concrete5.7. It was a kind of laboratory for me to discover the richness of this new version of the CMS. 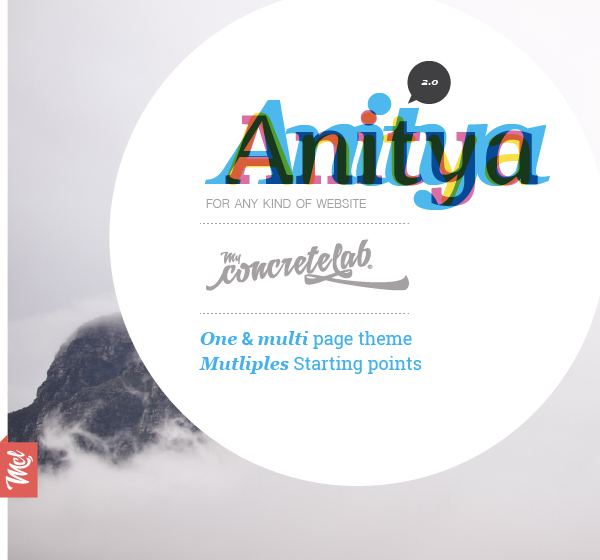 For over a year now Anitya was published, many features have grafted to Concrete5. Anitya try to derive maximum benefit with this second generation. It is strongly recommended that you use the latest version of Concrete5 (5.7.5.3) is the only one who can properly install "Starting Point". Anitya is a complete theme, very modern and adapting gracefully to all screens. It has been designed and coded with great care for all and especially for details. Each element of this theme has been created with love and attention. Its ease of use thanks, among other things, its super optimized color management, you will create your site quickly and especially with great pleasure. His numerous presets and starting points allow you to have a base of departure and elegant for your business or your client. Great care was also given to the many visual features that make navigation fun and happy. Smart strucure of pages allow you to create an infinite number of layout with ease thanks to its exhaustive documentation. Anitya is the result of know-how experienced a designer present in Concrete5 since the beginning.